We continue looking at senior pets on our vet clinic blog. Last blog, we talked about signs you may see in your senior dog of ill-health or a loss of mobility. Today, our Wahroonga vet clinic looks at what you can do to support your doggy senior with some simple changes in pet-care in the home. It’s no secret that at Fox Valley Animal Hospital, we care a lot about maintaining a healthy weight for all pets. Being overweight or obese in any kind of pet can increase the likelihood of health issues and decrease life expectancy. Yet it’s one of the easiest things to monitor and control in your pet. To give you an example of how important weight is to a dog, think of a Labrador. Our lovely Labradors are always up for more treats, more dinner and more snacks in between. Yet an extra kilo of weight over a healthy weight range could reduce your Labrador’s life expectancy. Which would you rather? A plump dog or a dog that is there with you for longer once they hit the senior years? How do you know your dog is overweight or at risk of dog obesity? 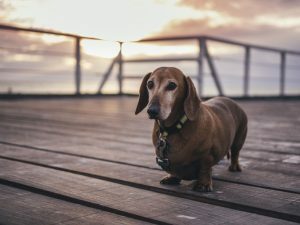 Want help determining if your senior dog could stand to lose some weight? We run a pet weight loss program at our Wahroonga vet clinic that you can join at any time. Our vets are more than happy to let you know about a healthy weight ratio and coach you and your senior pet to optimum health. Senior dogs have different needs. A dog’s nutritional needs change throughout their lifetime and it’s important to change when the lifecycle does. Senior pets need a change in diet and may also change the way they eat. You may find for example that if your dog is less active in the senior years, you may need to reduce the size of their meals. Our vets may also see fit to suggest that your senior dog is placed on a specialised diet. This maybe using senior dog food, or it may also include senior dog foods that have additional vitamins and minerals to help with conditions. Or adding things to the food such as osteo support, fish oil supplements and more to help promote health bones, teeth and skin. Noticing changes in how your senior dog eats can also help you understand any health issues. For example, if your dog is eating less than normal, this may clue you in to health issues. If your dog is willing to eat yet backs off once they start chewing, perhaps they have dental issues. If a normally good eating dog starts leaving food behind, it might be an indication a vet visit is in order. If their regular food makes them more flatulent then before, maybe they need more fibre in their diet. As the body changes, so too do the nutritional needs. We stock a wonderful array of dog food for senior pets as well as treats. Our vet nurses can also help with advice on integrating other household foods such as fruits and vegetables in your senior pet’s diet. If in doubt, come on in and get some advice from our helpful vet nurses. Your senior pet will be less active. That doesn’t mean they shouldn’t have exercise though. Many conditions such as arthritis, obesity, heart disease and diabetes that older dogs can have are better treated with regular exercise. If your senior dog is slowing down, so too should their regime. Think of walks around the block instead of runs. Or look at swimming to keep the body lean and strong without placing too much pressure on the joints. Keep exercise consistent so that hard, heavy impacts like days at the beach don’t over-tire or inflame sore legs and joints. Maybe the dog park visits will be replaced with age-appropriate playdates with doggy pals in the backyard. You might also need exercises to help you keep mobility at a premium. These could include balance exercises, stepping up and stepping down or even a set of physio exercises to promote movement. Support may also come in the form of regular medication and synovan injections to aid with maintaining pain-free mobility. Don’t forget too that you can also supplement the physical exercise regime with enrichment and mental stimulation. Using puzzles, Kongs and wobblers, you can help maintain a healthy, active mind while burning off excess energy in your dog through challenging them. Plus, it’s fun for everyone involved. Your older dog will want to continue to go for their walks and wanders. It’s a matter of reducing intensity and managing doggy expectations to ensure that health is supported. And to remain with an injury-free pet. Senior pets will sleep more and need specific sleep support. You’d think the amount a dog or cat naps during the day, they’d be a consummate professional in the 40 winks department. For the most part, they are. But there are also a few things you can do to ensure they make the most of their sleeping and rest. And actively discourage your elderly dog from lying on hard surfaces such as floors and concrete. Or surfaces that might be cold such as floor tiles, concrete and wooden floorboards. Want more tips on making your senior pet happy and healthy? We’re continuing the journey with senior cats next. Plus, you can always ask for advice directly at our Wahroonga vet clinic. Our vet nurses are happy to assist you if you pop in for advice. We also stock a wide range of senior support products including dog food, vitamins and supplements. As well as dog pyjamas and coats, toys and puzzles for enrichment and more. With a senior pet, our vets should be seeing them on a 6-month rotation as a minimum, more depending on individual health profiles. Want to get advice on helping your senior pet stay healthy? Book a consult today on (02) 9489 4805.